Let's be honest we weren't having much luck with restaurants in Croatia, it was starting to get frustrating, so we decided to take some advice and head out of town. There are two restaurants named on Frank About Croatia's blog that are a short drive out of Porec, they are apparently much better than a lot of the places you'll find around the coast or in the old town. The major disadvantage of this being that D would need to drive and we were also warned that Croatia has a zero tolerance for drinking and driving so he couldn't even have a shandy. 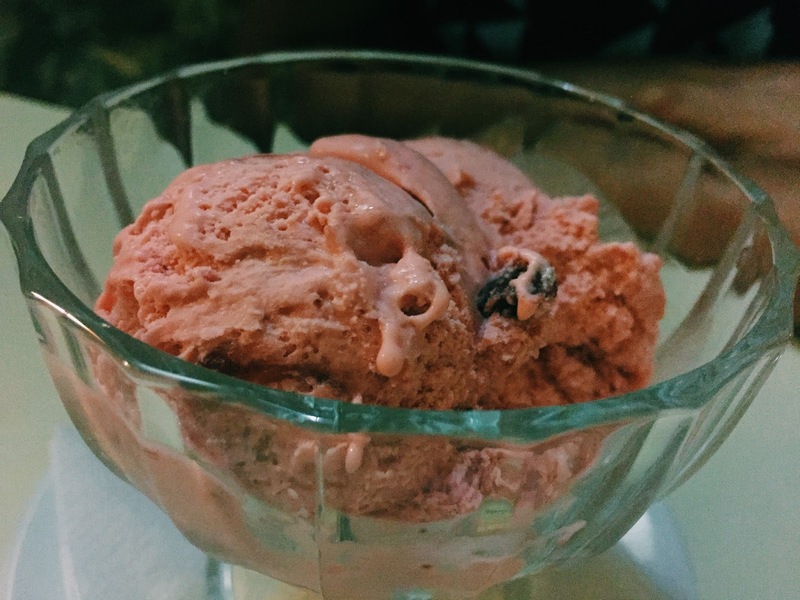 We chose Konoba Daniela for no other reason than it looked the best on Frank's blog. The drive out of Porec is a short one taking approximately 10-15 minutes which takes you in to the small town/village of Veleniki, where it quickly becomes clear everyone is there for this one restaurant. We struggled to find parking and this worried us, would be able to get a table without a booking? With the car safely(ish) parked down the road we wandered in. We approached a waiter apprehensively waiting for the abrupt 'no' that we were becoming accustomed to whenever we asked anyone anything in Croatia, and enquired about a table. He replied "of course" and we were promptly shown to a table on the decking outside. As D wasn't able to drink I announced that I too wouldn't drink thinking perhaps it was time to give the booze a rest. We both ordered soft drinks and set about looking at the menu. The menu was very similar to other menus we'd seen in Croatia. Cheese and cured meat for starters, pasta dishes, meat dishes and fish dishes. We skipped starters and I didn't really bother with the bread, it was stale and unappetising. For mains D asked the waiter whether he would recommend the sausages or another steak type dish. The waiter replied the sausages. D attempted to ask if it came with sides and the waiter said vegetables so D ordered the Daniela potatoes to accompany his sausages. 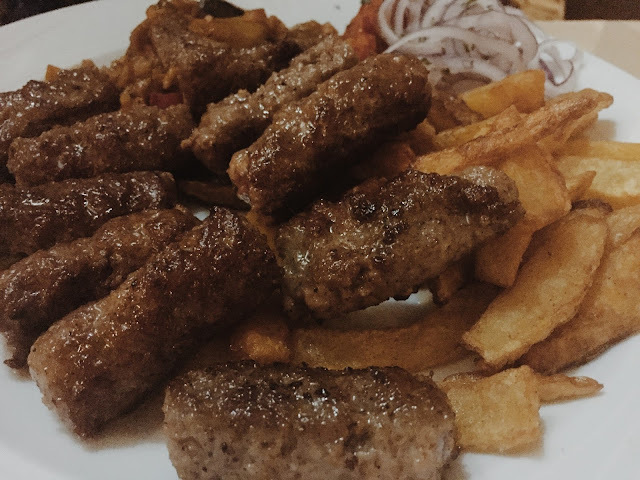 The sausages in Croatia are more kofte rather than the sausages we know at home. When the sausages arrived they came with potatoes... I guess potatoes fall under the heading of vegetables. Oops. 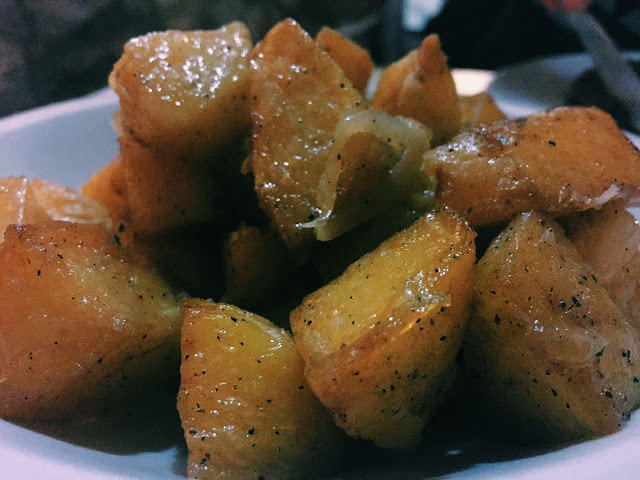 The Daniela potatoes are fried with onion and bacon, they were pretty good and I was more than happy to help D work his way through them. 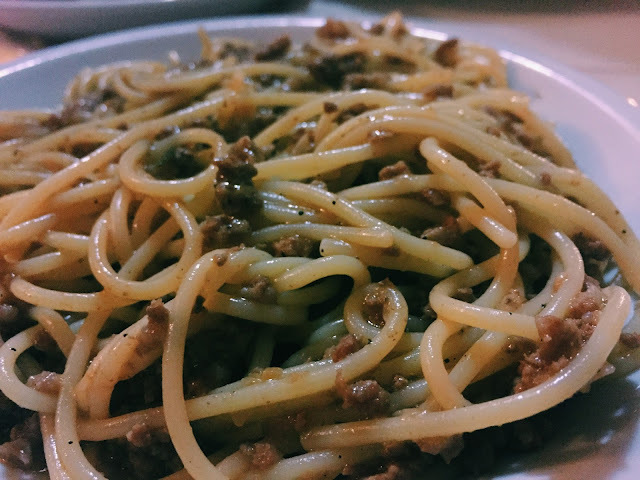 For my mains I chose the spaghetti bolognese, usually served as an interim dish between a starter and your main (just as they do in Italy) I asked if I could instead have this as my main. I asked with trepidation worrying that I may offend but instead this didn't seem to be a problem at all and they barely batted an eyelid at me. The bolognese was again different to what I've grown accustomed to, no tomatoes or thick red sauce with mince swimming in it. Is this the way Italian's eat spag bol too? Istria once being a part of Italy/Venice we saw a lot of Italy reflected in it's cuisines and customs. This particular bolognese tasted as if it was cooked in a beef and vegetable stock, although the tomato was missing it didn't stop it from being a very flavourful. Despite having an extra plate of carbs D decided that he wanted dessert. It took us an age to grab a waiters attention to ask if we could see the dessert menu. There was one waiter who kept blocking up our table's walkway whilst he made steak tartar at other tables. The steak tartar is one of Konoba Daniela's specialities and is prepared with raw minced beef at your table with a whole range of different ingredients. It certainly looked impressive although I'm not sure my stomach could have handled it. The other dishes that looked pretty spectacular were the sharer boards, if only we had known about them before we arrived and placed our orders! We eventually grabbed the attention of a waiter who brought us a menu, the next task was to grab another to order dessert. The meanest looking waitress came over, although about 5 foot tall she looked scary and not to be crossed. We couldn't have been more wrong, she was the nicest of the waiting staff we had encountered all night, laughing and joking with us. D asked our waitress for the Sorbetto, and she turned to him and said "you're Dutch right? Do you know what this is?" I sniggered as D was confused to be of Arian origin once again. 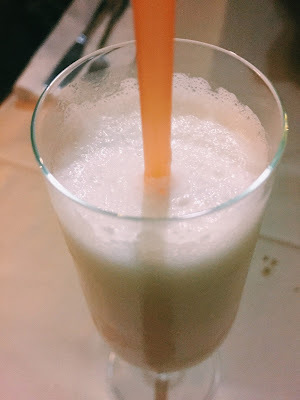 she gladly explained that Sorbetto is not sorbet but an alcoholic drink with spirits, cream and prosecco. As D was the delegated driver (by default - I still can't drive) Sorbetto was out of the question for him. So I gladly took up the mantle and through my no drinking (and no dessert) night out of the window. D opted for his next choice on the dessert menu, ice cream. You'd think the daily gelatos we consumed would have made him sick of the sight of ice cream, if you think that you'd be thinking wrong. This guy would bathe in ice cream if he could. When the bill was requested we were asked if we would like some schnapps, I definitely like this tradition, and I opted for the sweet rather than strong option (I'm crap at shots and the burning chest thing doesn't do much for me). The bill was brought with my yellow coloured schnapps and some Croatian donuts. 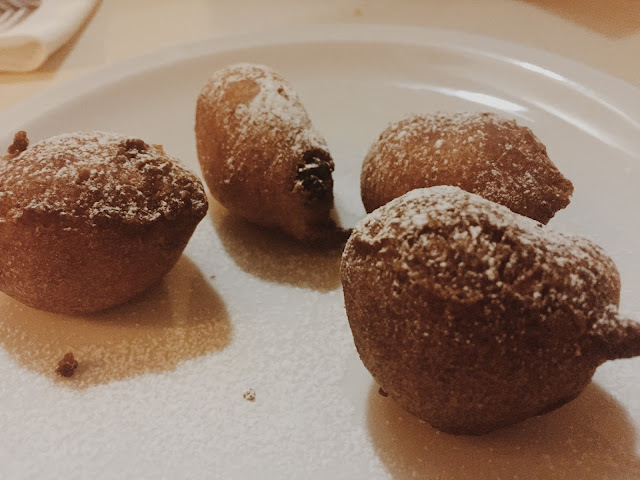 The donuts are a lot more chewy and less doughy than their English cousins, this didn't mean they were bad, just different and a nice accompaniment to the end of the meal. Our meal in total came to 189 kuna, about £19. The atmosphere in the restaurants and its gardens was relaxed, family orientated and also a little bit romantic as the trees lopped over the walls and dim lights shined on our tables under the moonlight. I can see why the locals enjoy this place, the prices are good, the staff in general a lot more accommodating and friendly and the food is traditional but made with care and passion (unlike the tourist traps in the centre).